A deep gray charcoal colored base packed full of micro pink glitter and round iridescent silver and pale blue glitters of varying sizes. I don't own enough gray polish or rather there is no such thing as too much gray in my collection particularly when it's paired with pink shimmer. Clearly this is reminiscent of the not that long ago released Marmalado, but it's even more complex. This one was tough for me because of the density of the formula. In other words you must be patient to prevent overloading your nail beds when applying this polish. You won't have to fish for glitters either because the polish is literally crammed full of them. Thin and careful coats will work best. Pictured here in 3 thin coats plus topcoat. A deeper pink almost raspberry colored holographic. I'd say the level of holo on this one is a medium to strongish linear. 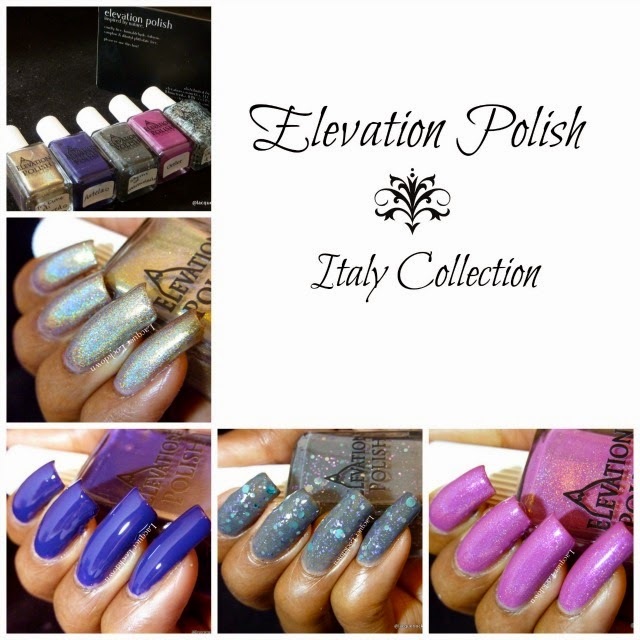 Certainly compared to Tre Cime it's one step down in terms of holographic pigment power. This one is bliss! Utterly utterly flattering with my skintone and likely a lot of other skintones as is the way of most medium colored pinks. The formula on this one was a a shade thicker than I prefer my holos but because of that it was also a even one coater over FNUG Aqua Basecoat. We all know how much I love one coaters lol ;) For the nail art here I kept things very whimsical. The minute I opened my package and saw this polish I knew it was game over! A deep eggplant purple creme. And for as long as I have loved and purchased Elevation Polish I will always have a deep and abiding affection for EP cremes. Flawless flawless coverage n 2 coats. I want to paint my whole hand in this one and just stare. Clearly this was my favorite of the entire collection. I love your cremes Lulu! Please always continue to make them. I chose a lighter stamping polish on purpose to force Antelao to lean closer to it's true plummy purple so the nail art photo is actually a bit more color accurate. A jaw dropping gold holographic with green shimmer undertones. I'm just gonna say it - damn this is beautiful! I don't know how Lulu makes these shimmering holographics, but every time she does I am in awe. I am blown away and to date I have never ever seen another polish maker create colors like these. This gold will likely require a bit of sunkiss to the skin for some of my fairer lacquer loving ladies. On my skin tone it's dead on flattering and eye catching enough that instead of thinking about summers in Italy I'm imagining champagne on New Year's Eve! Opaque in one coat over FNUG Aqua Fix. Another endlessly flawless formulation from Lulu. I could barely stand to stamp over this one. In reality I have a very hard time stamping over holographics in general especially when they are this drool worthy. I ended up keeping my nail art very simple and elegant here. I was able to capture a bit of the green shift above. The polishes in this post were provided for honest review for more information please see my Disclosures policy. So excited to grab these today!